November 16, 2016 3:11 pm. THE big city race meets are the ones we all talk about. But our greatest races might just be found in our own back yards. Those special country race meets, both grand and small, are the life blood of the racing community. They swell the coffers of local race clubs, allowing them to run their events throughout the year and they give opportunities for struggling jockeys, trainers – and their donkeys – to perhaps enjoy the fruits of a in that they might never achieve on the big stage. People meet their true loves at country race meets. They get sauced up to their eye balls. And, on the whole, they have a hell of a fun time doing it. Country race meets bring their local communities closer together. They create communities by bringing people in from neighbouring towns and suburbs. And then they expose outsiders to the wonderful towns and communities within those towns where the race meetings are held. People fall in love at local race meetings. If it wasn’t at the local dance, there is a chance it was at the Cranbourne Cup. You meet salt of the Earth people, as well as people attending their first race meetings. There are the mad punters. And then there are the people who are just there to hang out with their mates. There are mums, dads, sons, daughters, lovers and friends. All there for one thing. The quality of the horse racing is a bonus. And hey, if you can jag a winner, more power to you. Provided you are gambling within your means, if you happen to attend a country race meet you’re guaranteed to be on a winner, even if the results don’t quite go your way on the race track. Here are our five favourites. Let us know if we have missed any and add yours in the comment section below. 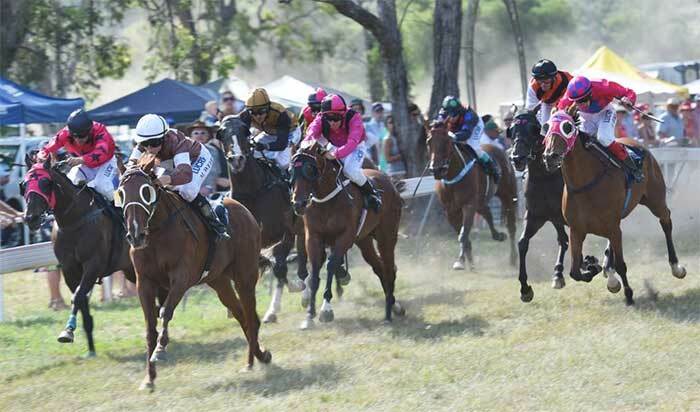 The Wallabadah Cup is known as the oldest surviving race meeting in the country, with the New Year’s Day event about to hit its 165th year. That’s right. This little bush meet that is lucky to get 1200 people along is older than the Melbourne Cup. The little New South Wales town has a population of about 200, but, each New Year’s Day, that number increases six fold for their big race day. The blokes wear akubras. The women wear fascinators. And the horses are donkeys, but if you are looking for a grassroots racing event that harks back to yesteryear, this is the one event you should not miss on the calendar. Probably our favourite story out of this event is that, each year, after the race meet is complete, they erect a sign saying next race meet: January 1. The bogans from Cranny know how to party! It’s beginning to be a bit strange to call this event a country cup, given there are some 10,000 or more punters that now turn out to it each year. It’s one of the more prestigious race meets on the country calendar and, with any horse that wins it and then goes on to win the Cox Plate the recipient of a massive $1 million bonus. It’s great incentive for some very, very good horses to hit the track in Melbourne’s south east. The punters are a huge cross section of society’s best and worst, they get blind, they party, they have fun. There have been some pretty solid visitors to the track too, with the likes of one hit wonder Gabriella Cilmi among the entertainers to perform. If you like a country meet that is big in every way, the Cranny Cup is for you. The November racing event has a little bit of everything. A rich history, dating back to 1866, gives this race day a very vintage feel, while the track underwent a full scale redevelopment throughout the 1990s that gives it the feel it has today. It has loads of space for punters to enjoy and is quite picturesque. The $1 million race day is centred around the Ballarat Cup and features the usual fanfare, like fashions on the field, local bands and DJs and a crack at the Sportsbet.com.au Reverse Running Race for your chance to win $10,000. You could argue this isn’t a country event, but anywhere named Doomben has to be considered country. Some of the greats have won the major race, including Takeover Target and Bernborough. it’s a bumper crowd to one of Queensland’s great race days, but there is the fear that it could be completely ruined by the meeting’s proposed shift to Eagle Farm. There are plans in place to shift the race from the track, change the distance and relabel it something like The 10,000 or Brisbane 10,0000. Our take: Don’t fix what ain’t broken. We love quirk as much as the next bloke. And you can’t do quirk better than a race meet called Bong Bong that is exclusive to members only. The members are allowed to bring one guest to the event. It wasn’t always like that though. You can’t knock an event that was so messy it actually got shut down in the mid 1980s. Yep, the crowds – sometimes over 35,000 – were simply too hard to control, so organisers had to give it the chop. The race club runs the cup in November each year at Wyeera, in Bowral, New South Wales. it’s been running since 1886 and, side from its hiatus from 1985-92, is still going strong – and is now a mystery to mere mortal punters. Every country town or regional city in Australia that features a race club generally boasts a feature race that attracts a big race. Some of the biggest country cups include the Albury Gold Cup, the Wagga Gold Cup, the Sale Cup and the Hamilton Cup.